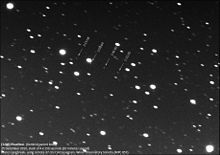 Asteroid (3200) Phaethon imaged on 25 Dec 2010 with the 37 cm F14 Cassegrain telescope of Winer Observatory, Sonoita (MPC 857) by Marco Langbroek. 3200 Phaethon, sometimes incorrectly spelt Phaeton, is an Apollo asteroid and a dead comet. It was announced on 14 October 1983 in IAUC 3878, with optical confirmation that it looks like an asteroid. It was the first asteroid to be found by a spacecraft. It measures 5.10 km in diameter. Phaethon approaches the Sun closer than any other numbered asteroid. Its perihelion (closest approach to the Sun) is only 0.140 AU – less than half Mercury's perihelion distance. It is a Mercury-, Venus-, Earth- and Mars-crosser. The surface temperature at perihelion could reach ~1025 K, or 1400 F. For this reason, it was named after the Greek myth of Phaëton, son of the sun god Helios. Phaethon approached to 18.1 Gm on 10 December 2007. It will draw nearer in 2017, 2050, 2060, and closer still on 14 December 2093, passing within 0.0198 AU (3.0 Gm). This page was last changed on 13 August 2018, at 04:43.